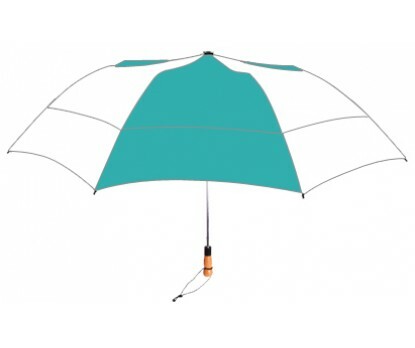 Personalized teal & white 58” arc vented little giant folding umbrellas are unique in more than one ways – an attractive color presentation, and very strong looking features. This umbrella can serve a user through all harsh days, thereby giving longevity to your business messages. 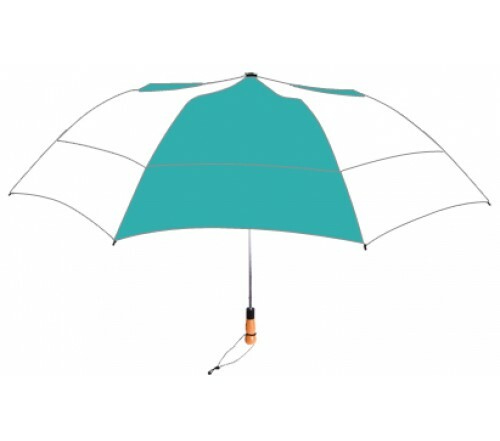 Features – large vented 58” arc teal & white canopy, automatic open function, folds to just 22”, stronger six sided chrome shaft, wooden handle with wrist wrap, fiberglass ribs. It can be sought with matching fabric case & shoulder strap. Imprint area - 6”H x 8”W.